Questioning Answers: How much does it cost to assess a child for autism? How much does it cost to assess a child for autism? In answer to the question titling this post - 'How much does it cost to assess a child for autism?' - the results published by Mark Galliver and colleagues  provide some important findings, at least pertinent to the diagnostic experience here in Blighty. 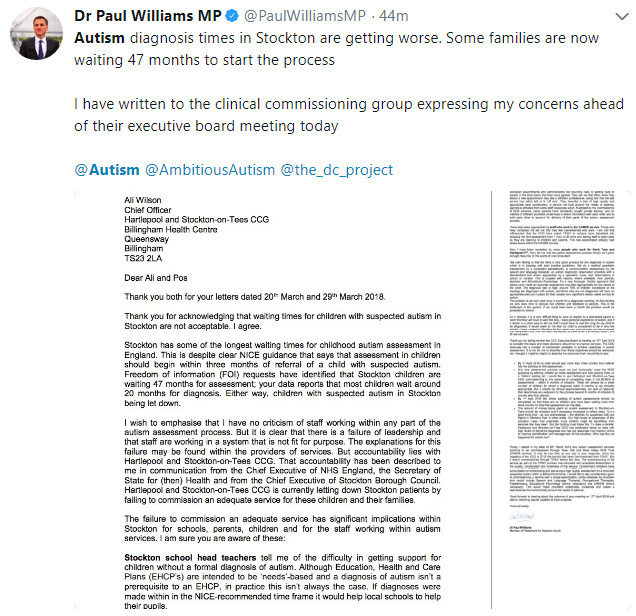 Authors concluded that assessment for autism "typically takes 13 hours of professional time" and costs somewhere in the region of "£650–£1000 ($975–$1500) per child." Importantly too, the staff costs of around £800 per assessment do not cover "costs of intervention, parent psychological education, investigation and assessment and management of comorbidities." I appreciate that talking about 'financial costs' associated with autism (assessment) is not a topic everyone will enjoy discussing. Much like other 'bean counter' discussions (see here and see here), everyone [rightly] aspires to providing this, that and t'other to improve facilities with regards to diagnosis and indeed, post-diagnostic services. The financial reality however, particularly in these days of continued austerity, is that such services are often under-funded, under-resourced and headlines including words like 'two year wait' for diagnostic assessment (see here) are not uncommon. People rightly get angry about this but the services themselves and the people delivering them are not to blame. Galliver et al started out with some important premises. First, there are a growing number of referrals for assessment for autism. Second, such an 'increase in demand' naturally puts greater pressure on diagnostic services resulting in longer waiting times. Third, there are recognised pathways for referral and assessment for autism, but the resourcing of such pathways might not always be optimal either in form or amount. All of this is set in the context of the National Health Service (NHS) providing clinical and medical services here in the UK, free at the point of need and all that. Researchers therefore decided to ask various local child development centres (CDC) in England about their diagnostic experiences in terms of resources and costs. Various questions were asked pertinent to the pathway used to deliver assessments and professional time typically allocated to said assessments. They report on responses from 60% of the CDC - no, not that CDC - initially questioned, covering a range of services in different geographic locations. I don't need to rehash the financial findings again. I will however mention a couple of associated points that might be relevant. First, autism rarely exists in some sort of diagnostic vacuum (see here). The authors make the point that their figures did not cover the "investigation and assessment and management of comorbidities" something important in these days of greater realisation of 'autism plus' and ESSENCE (see here). In this respect, the figures provided by Galliver are likely to be an underestimate of the true financial cost of assessment. Second, the issue of growing numbers of referrals and "increasing demand" for diagnostic services is highlighted in various parts of the reported findings. I have my own opinions as to why this is happening (see here and see here) but the one thing that is becoming increasingly clear is that such an increase is probably not just due to better recognition of autism or issues such as diagnostic switching (see here and see here). Yes, these points were probably relevant about 10-20 years ago, but now, I'd have to say not as much as [clinical] awareness must have peaked by now. At some point the question of 'why the increase' is going to have to be properly faced up to if it's not going to be all about just assessing and diagnosing in a catch-up sense. Finally, although more funding would help, such demands on assessment services are probably not going to be met by just 'throwing a few quid' at them. The NHS is moving with the times in other areas; and the rise and rise of technology to potentially assist with autism assessments is becoming increasingly important. I'm thinking about work such as that being done at the Duda-Wall laboratory (see here and see here) where technology such as machine learning is being used in the context of autism screening. And things like autism screening triage via YouTube (see here) *might* also [eventually] become more commonplace. Technology can potentially ease the burden on assessment services. Whatever does or does not happen as a result of findings such as those by Galliver and colleagues, the underlying messages are that autism assessment is (a) not an inexpensive process and (b) either significant funds need to be poured into the service or services need a revamp on the basis of current funding schedules and as national finances allow. 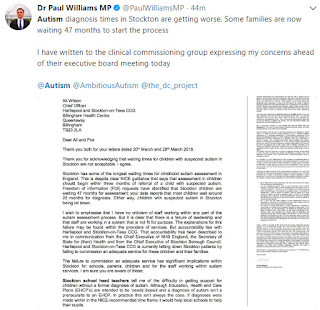 Either way, I don't see assessment waiting times improving much in the near future despite the important work provided by our fantastic NHS and the desperate need for timely autism assessment.